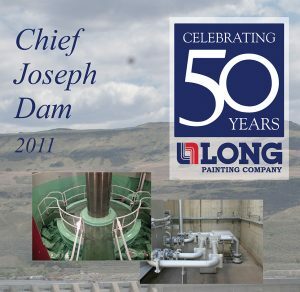 In 2011, Long Painting Company won a seven-year contract to sandblast, remove lead, and repaint 13 turbines at the Chief Joseph Dam in a remote area of the Columbia River. Long Painting Company worked extra hard to gain the confidence and trust of the owner and fellow contractors. In order to meet the demands of the tight time frame, a protocol was developed for each phase of work. Committing to this protocol allowed the team to complete each phase ahead of schedule and allowed the customer to gain days on their schedule. As a result of the project’s success, Long Painting Company has since secured work on the Ice Harbor Lock and Dam, as well as the Priest Rapids Dam. « Congratulations to the Vancouver Office for Winning the “New” Long Cup!